Adventure Time (with Finn and Jake) is literally one of my favorite shows of all time. Not to suggest I don’t enjoy more adult fare too. I love The Walking Dead, Arrested Development, Alcatraz, Family Guy, Futurama, Johnny Test, Grimm, Once Upon A Time, and too many others to list because it exposes just how much time I waste sitting on my rear watching television. <sigh> But I can watch AT all the time and never really get bored, which says a lot for a kid’s show averaging 12 minutes per episode, with but 3 seasons in the can (so far). I guess I’m a little over-excited since new episodes are hitting the adult-tube on April 2nd. I can’t wait! But why bring this show up in the first place, you’re probably thinking as you scratch your head. Well, I think a lot can be learned from this show. It shouldn’t get overlooked just because it’s on Cartoon Network. First, the show takes place in the Land of Ooo. Through reveals during certain episodes and the opening shots, the viewer realizes Ooo is actually planet Earth following some horrible, terrible catastrophic event. Remnants of war, bombs and planes and such, hang around like half-buried memorials to the world that used to be. Throwing logic right out the window, magic has become very real, the Candy Kingdom is filled with living, breathing, talking candy people, and Finn is the “last” human left. Maybe I enjoy the show so much because in some ways, I really am still a child. For example: When you see a house with a turquoise/blue lawn, you know that pesticide was recently put down, right? Well, I thought it was paint and I didn’t learn it wasn’t until my husband told me so. One day I had remarked how silly it was that people painted their lawns in summer since the grass dies – especially since they painted it an unnatural color like blue – and he actually doubled over with laughter and told me through his tears that it was pesticide, not paint. I was 22 at the time. Just so you know. Go ahead and get your laughs in. I’ll wait and doodle. 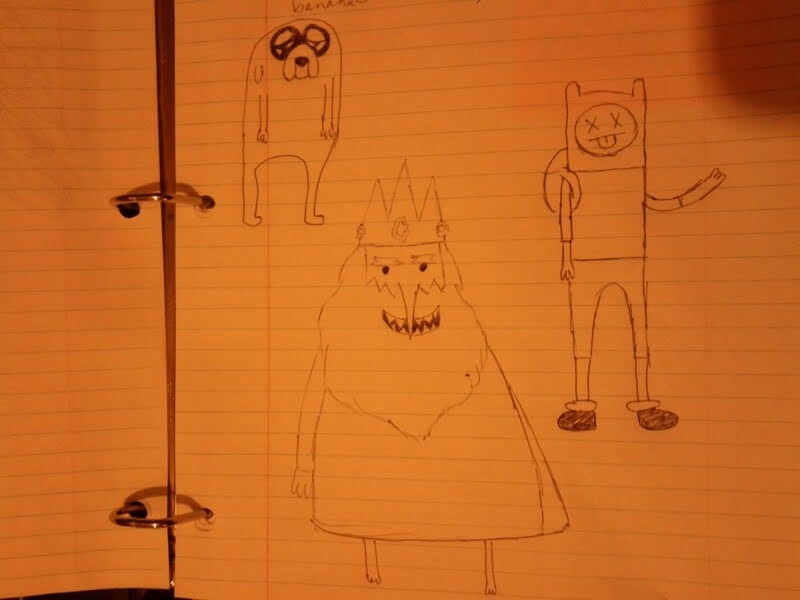 From left to right: Jake, Ice King, Finn. Also my not-so-hot drawing skills are so math, right? But really, the biggest lesson I take away from Adventure Time is to have fun, be yourself, be silly, be whatever you feel like being. (Insert create wherever it fits.) I realized recently I’ve been so wrapped up in writing something good — something that matters — I haven’t been creating and there is a difference between the two. So thanks, Penn Ward and the Adventure Time cast and crew, for reminding me to enjoy what I do, even if I get a little silly (or plain crazy) at times.